After attempting to control the disease several times in the last decade, the state is making efforts to eliminate the disease. Will it work? 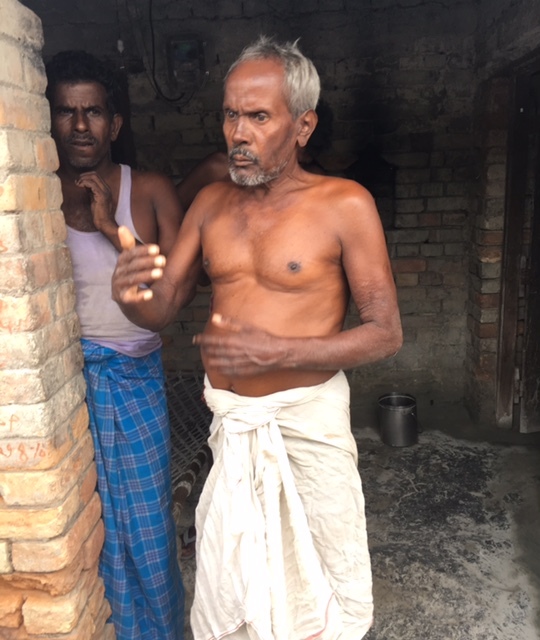 “Do you know anyone who had kala azar?” Dr Vikas Aggarwal asked Nandu Singh of Santari village in Muzaffarpur district of Bihar one day in August. Aggarwal is part of the KalaCore consortium, a team of organisations that is now on a mission to control and eliminate the disease in India, Bangladesh, Nepal, Bhutan, and Thailand. Sixty year-old Singh, who works as a farmer in the village reported that his son had it about two years ago. “We had to stay in the hospital for at least two to three weeks,” he said. Kala azar literally means "black fever" and signifies the greyish discolouration of hands, skin and face. The scientific name for the disease is visceral Leishmaniasis and it is caused by a leishmania parasites transmitted by female sand flies or balu makhi. These sand flies are not even visible to the naked eye. The disease is characterised by irregular bouts of fever, weight loss, enlargement of the spleen and liver that shows up as a pot belly in the patient, and anaemia. The disease sometimes called the “parasitic HIV” as is destroys its victim’s immune system and is almost always fatal if left untreated. Like HIV, a kala azar patient either dies after catching another infection such as tuberculosis or of severe anaemia. On February 16, the Bihar chief minister announced this additional Rs 6,600 compensation for each patient cured of kala azar. The central government was already giving Rs 500 as compensation for treatment. This effectively means that a patient walks into the health centre, gets treatment for three hours, and walks out free of kala azar and Rs 7,100 richer. Singh looked puzzled at Aggarwal's announcement. “We had put in our own money for the treatment of my son,” he said. The scene looked like it was straight out of a government advertisement. But it sums up what has changed in the kala azar control programme. Poster in a public health centre at Chakia block in East Champaran district, Bihar. Photo: Menaka Rao. With international agencies showing interest in helping eliminate kala azar in India in 2014, the government announced Kala Azar Elimination Programme in four states of the country – Bihar, Jharkhand, West Bengal, and Uttar Pradesh. Elimination for India is defined as reducing the annual incidence of Kala-azar to less than 1 case per 10,000 population at the sub-district level. Bihar has the more than 70% of the disease burden with kala azar endemic in 33 of 38 districts. The number of kala azar cases shot up from 18,088 in 2003 and reached a peak of 45,508 in 2007. Since then, the cases have been on a decline and have come down to 8500 last year. The incidence in Bihar, 19 kala azar endemic districts in West Bengal, and four kala azar endemic districts in Jharkhand was more than three cases per 10,000 population in 2014-'15. Uttar Pradesh has six endemic districts which has kala azar cases but had already reached elimination stage by 2015. "If we calculate the incidence in Bihar state, it is less than one per 10,000 population," said Dr MP Sharma, Bihar state programme officer who handles kala azar and other vector-borne diseases such as malaria. "But we need to achieve that at the PHC level. Some pockets of the state still have more than 1 per 10,000 population." From about 11 deaths due to reported in the country in 2014, it dropped to five in 2015. This year no deaths have been reported in the country so far. Members of KalaCore, which includes international non-profits like Drugs for Neglected Diseases Initiative, London School of Hygiene and Tropical Medicine, Medecins Sans Frontieres, and consultancy firm Matt Macdonald, were on a tour of Bihar in August.They were checking on public communication activities to detect more cases, on indoor residual spraying in villages, and on the cold chain – transport, storage and handling – of Liposomal Amphotericin B in public health facilities. The drug has enabled treatment for kala azar to be cut down from a four-week long cycle to just one day. All the district hospitals of the state provide treatment as do several public health centres at block level. Mukesh Singh is on the road all day on his motorbike. Singh is the Samastipur district programme manager of New Concept that handles the public health communications programme for KalaCore. Typically, a communication programme would take place before the village is fixed for indoor residual spray. The staff of New Concept would conduct a behavioural change communication in a village involving a short film, slides, and a question-answer session from the villagers. He follows a microplan for indoor residual spraying of each house and cowshed in the villages in his district that had one kala azar patient in the last three years. “We earlier had a stirrup pump which required two people to operate,” said Sharma. Singh has to co-ordinate with the ASHA worker to mobilise the community, the indoor residual spray squad, and the kala azar treatment supervisor who work at the block level to detect cases of the disease. 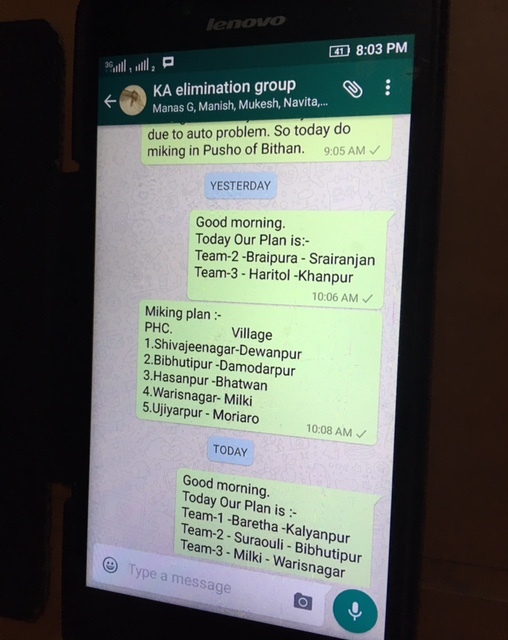 Singh co-ordinates with these different groups of workers via Whatsapp. “Typically we would go to a Musahar tola or a tola of a backward community to generate a demand for various services from the government including indoor residual spray,” said Vidya Raghavan, assistant director at New Concept. If residents in the village point out to possible kala azar affected people after the awareness programme, the team also coordinates to refer them to a PHC, and checks on the treatment taken. On the road, hopping from village to village, the KalaCore team checked on the availability of AmBisome – the Liposomal Amphotericin B drug – in the designated hospitals, including checking for the temperature of the freezer, indoor residual spray, active case finding, and the behavioral change communication activities in communities. The various activities related to elimination must all simultaneously run in tandem for this mission to work. Village in Bihar are divided into tolas, each of which houses people from on particular caste. The most marginalised communities, such as the Musuhar community, among others are the most vulnerable to the disease. Many of the people living in the backward caste Bhagat tola do not own land and work as labourers for the higher caste residents. Their houses are made of mud where they also keep cows or chickens. Mud houses that preserve moisture are ideal conditions for breeding of the sand fly. Joginder Bhagat was treated for Kala Azar this April and received compensation of Rs 6,600. Photo: Menaka Rao. Early this year, 60-year-old Joginder Bhagat often fell sick. His stomach swelled up and he had fevers. He went to see a local doctor but got no relief. In April, he went to the Motipur Public Health Centre, a designated kala azar treatment centre, but was referred again to Muzaffarpur city’s Shree Krishna Medical College. “There was no blood in my body," he said, referring to his severe anaemia. "They also gave me 15 bottles of saline, along with blood transfusion.” At the end of the treatment, he got a cheque of Rs 7,100, which included the Chief Minister’s compensation of Rs 6600 and the Centre’s compensation of Rs 500. This money is supposed to compensate for the wages lost. Bhagat’s son, Sanjay, 28, had fever for more than three months. In June, he was diagnosed with kala azar at the Motipur primary health centre but the drug AmBisome was not available. “I went three times to the Motipur primary health centre to get treatment for kala azar after being diagnosed,” complained the younger Bhagat. “I had to take a vehicle each time. The KalaCore team had checked the Motipur primary health centre and had seen that it had stocks of the drug. Noting the earlier stock out, they urged the villagers to go to the government centre where the treatment would be free of cost and the cost and they could avail of the chief minister's compensation. “But the staff in Motipur spoke so badly,” complained Chinta Devi who had taken her son there a few years ago. Many of Bhagat's neighbours prefer to go to Rambaug’s famous Kala Azar Research Institute but those who sought medical aid there said that they have not received their compensations. Only 64% of the patients who availed of the treatment have received the compensation so far. The rest are being processed, said Sharma. The younger Bhagat, who got tired of traveling up and down from Motipur, also went to Rambaug and received Rs 500 as compensation only. But, he is now free of kala azar. "They treated me in a day,” he said.